On a cold, wet, miserable summer morning, cosy socks are just the thing to remind you that winter is just around the corner. Having made three pairs of plain socks, I decided it was time to stretch my knitting muscles and try making something different. After thinking about it for a while, I decided to try making house or bed socks, preferably using bigger needles and a DK yarn. 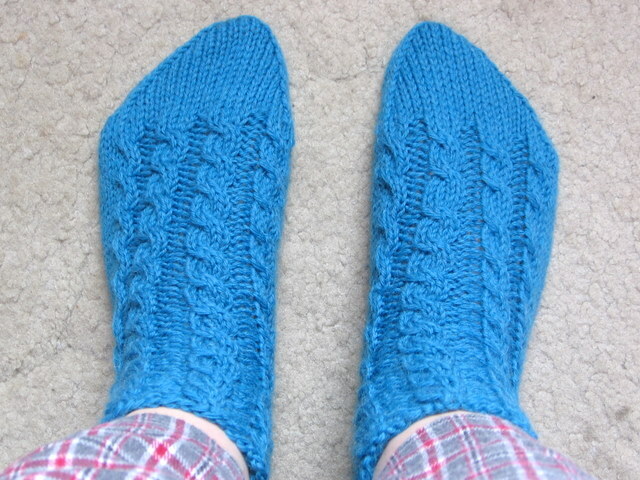 So I came to the Cabled Footies (Ravelry Link) from One Skein by Leigh Radford (another Ravelry Link). These are knitted up on 5mm DPN's, which was convenient since I picked up some 5mm sock needles for working on the Mouldy Raspberry Hat. I used one of Mercia Wools' Superwash Wool in a DK weight, meaning the end result can be thrown in the washing machine... Which I'm afraid I consider a must for something as basic as socks! I couldn't face the idea of juggling a cable needle as well as the DPN's so I used Grumperina's tutorial to learn how to get by without one. After the initial apprehension of slipping live stitches off the needle this proved to be quite straight forward and meant I sped through each sock, so much so that I finished the pair in a week and a half - which for me is fast. I made one modification to the pattern and that was to decrease every row for the last three decreases, rather than every other row. The idea was to give a slightly less pointy toe which I think I managed. 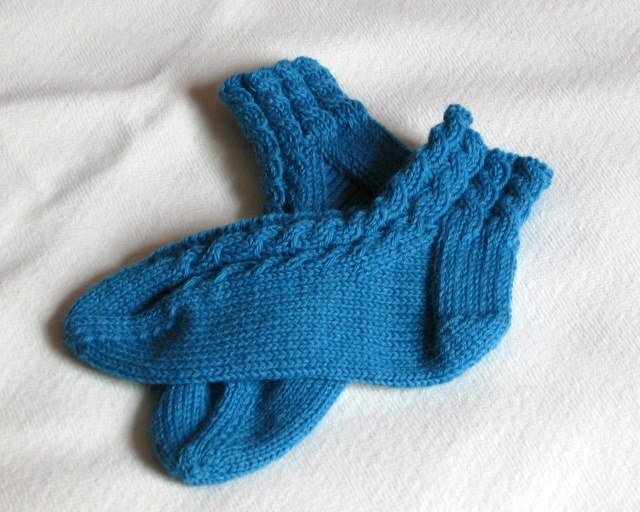 All in all, a cosy and warm pair of socks that I will probably make again. This particular pair are intended for my mother, who I hope will find them useful. They look nice and snuggly, I'm sure your mum will love them.